“Sweet Auburn,” a portion of Auburn Avenue in downtown Atlanta, is a historic district that reflects the history of the culture of the city’s African Americans. Originally a result of racial segregation, the designated National Historic Landmark is home to the birthplace of Dr. Martin Luther King, Jr. and the Big Bethel AME Church, believed to be the oldest African-American congregation in Atlanta. 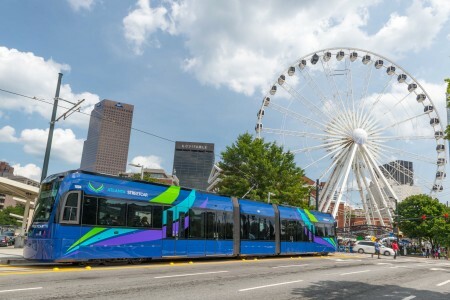 In 2010, the City of Atlanta announced that its new 2.6-mile public transit streetcar system would run in a loop along Auburn Avenue from the Martin Luther King, Jr. National Historic Landmark site to Centennial Olympic Park. To power the electric streetcars, Georgia Power was required to install a new 115kv underground transmission line. The new line runs along the historic Auburn Avenue (see map), and is buried as deep as 50 feet. The preservation of this historic district and its significant landmarks, combined with as many as 15 underground utilities located beneath Auburn Avenue, made the installation of a new transmission line extremely challenging and unique. To ease building owner concerns and document the existing environment, it is important to capture the “before” conditions of buildings prior to starting construction. Terracon performed building condition surveys to record the conditions of the buildings, and the same survey was repeated after construction. Terracon personnel visually inspected the structures and recorded their conditions using more than 7,000 photographs, videos, and field notes. An instrumentation and monitoring program that detects ground movements serves as an early warning of potential damaging conditions. For the Atlanta Streetcar project, the program included Multiple Point Rod Extensometers at 12 locations, conventional survey monuments, and numerous crack meters. 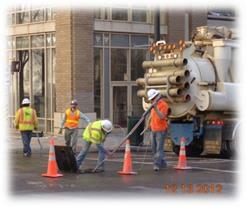 The Rod Extensometers were able to detect minute ground movements as the drill head and pipe passed underneath. Older buildings naturally develop cracks over time, and it’s important to take this into consideration before starting construction. Based on the results from the pre-construction survey, Terracon installed crack meters over 36 existing cracks and monitored the changes of crack width during construction. Terracon used vibrating wire crack meters which are so accurate they can differentiate the changes of crack width caused by construction from those caused by natural fluctuation of temperature and humidity. Terracon also monitored ground vibrations during construction. 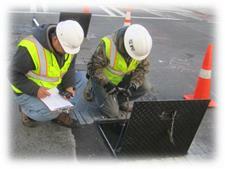 An integrated m onitoring program allows engineering and construction teams to obtain real time information on building behavior and ground movements. The information helped the construction team to adjust construction techniques to minimize impact to the existing structures. For example, during pre-construction survey, Terracon found several cracks on the marble lintels and sills on several large windows at the Big Bethel AME Church. These cracks were small and were probably unnoticed before the surveys. However, because of the historic significance of the building, the consequence would be enormous if the construction caused additional damage to the broken marble lintels or sills, or if the construction team is accused of the damage simply because the pre-construction conditions of the building were not documented. Completed in 2014, the Atlanta Streetcar Project is an urban transportation solution connecting the downtown, increasing mobility, and acting as a catalyst for development. With Terracon and the construction team’s diligent monitoring, this modern streetcar may pass through Sweet Auburn without disrupting its historical structures. Atlanta Streetcar Project was hailed as a success, and revitalized the historic Sweet Auburn area. Planning for the next phase is underway.